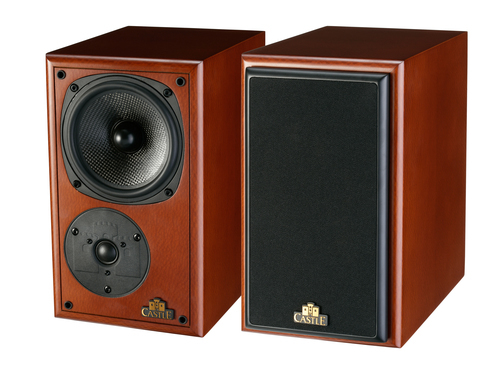 Castle maakt al jaren geweldig mooie speakers. Het is een traditioneel speakermerk dat mooi afgewerkte producten maakt. In tegenstelling tot veel moderne speakers klinken Castle speakers niet scherp, vermoeiend of agressief. Het zijn speakers die heel erg passen bij wat onze klanten zoeken in hun hifi beleving. Het geluid is vol, lekker, gedetailleerd maar vermoeid nooit. Je kan uren naar speakers van dit merk luisteren zonder dat het geluid op gaat vallen. Castle levert al 40 jaar de Richmond speaker. Deze klassieker is in de Anniversary Special Edition versie extra mooi afgewerkt en voorzien van zeer hoogwaardige terminals, filter componenten en drivers. Ook de kasten en het toegepaste fineer zijn van topklasse kwaliteit zoals u alleen bij veel duurdere speakers kunt verwachten. Deze set past door zijn homogene geluidsweergave perfect bij onze veel verkochten Quad 33 – 303 combinatie maar ook met andere vintage of moderne versterkers zult u genieten van een weergave van ongekend goede kwaliteit. 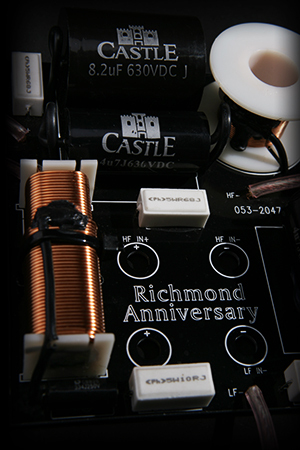 Ever Since Castle was founded over 40 years ago, the Richmond has been an industry benchmark for sound and build quality. 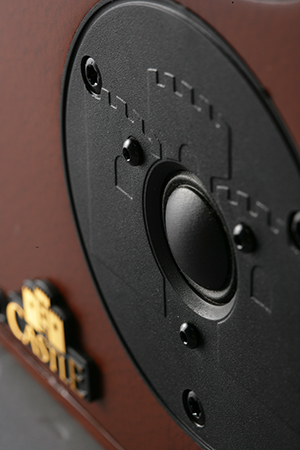 The Castle Richmond is somewhat of a cult item among hi-fi enthusiasts – known for its exceptionally natural reproduction of musical instruments and voices in a compact studio monitor format. 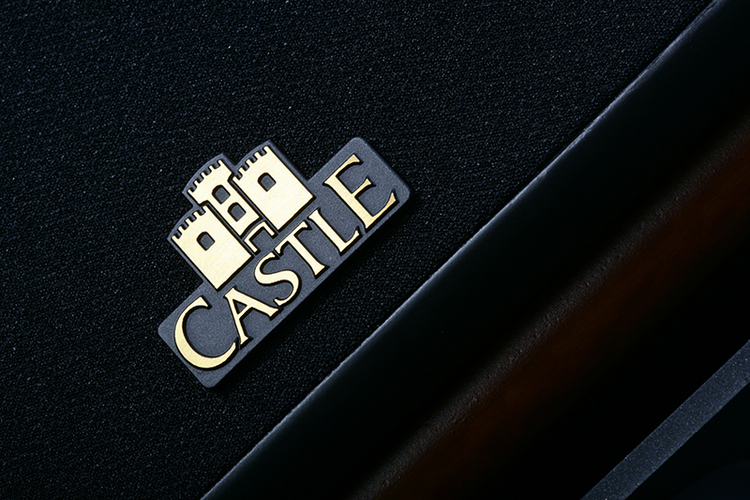 Castle proudly re-introduces this legendary model in a collector’s anniversary edition with refinements to the cabinet design, voicing and finished in a luxurious lacewood veneer. 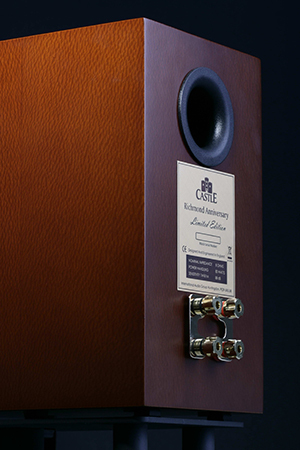 For this anniversary issue our engineers have investigated every aspect of the Richmond performance to extract the ultimate sound quality from this diminutive monitor-class speaker, all with the attention to detail and all consuming love of music that made the original such a hit. To start, the behaviour of the cabinet was investigated using the latest vibration and spectral analysis. 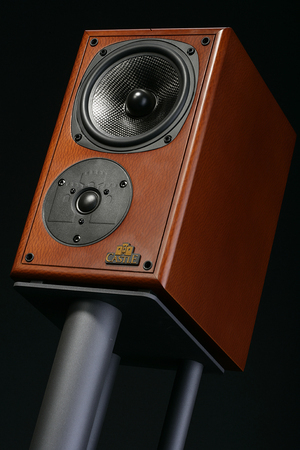 Richmond’s original 15mm MDF cabinet was later dampened by the addition of bitumen damping pads to reduce the audible effects of panel resonance. 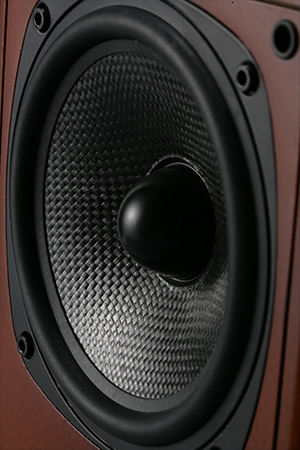 Additionally, multi-layer composite panel materials combined with loose fibre weaves further reduce resonance and absorb internal sound waves. Within the cabinet use of judicious bracing ensures that the dynamic capabilities of the drive units are fully realised. Castle’s famous carbon fibre woven cone is retained as it offers exceptional strength to mass ratio, operating as a pure piston over its pass band. The motor system usilises a kapton former with a copper clad aluminium voice coil to achieve a wide bandwidth in to the treble region. 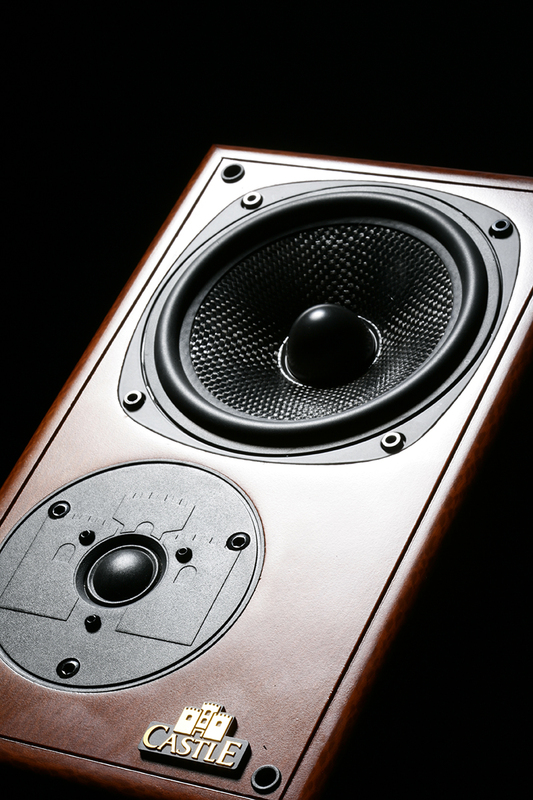 Treble frequencies are handled by a polyamide micro-fibre 19mm dome, its small diameter enabling piston-like performance and extended HF to well beyond the limits of audibility. 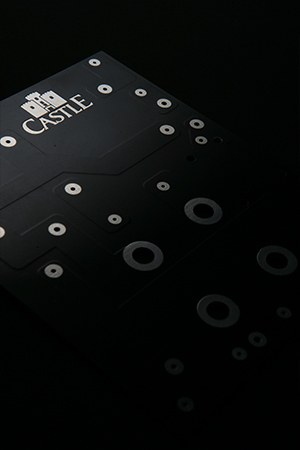 Crossover components have been chosen for their transparency and include silicon-ireon laminated core bass inductors, generously oversized air core inductors and Castle’s proprietary polypropylene low-loss capacitors. 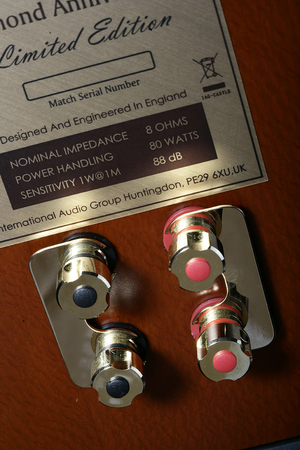 Placing the treble unit below the bass unit provides a degree of time alignment between the units allowing the phase accurate crossover, with linkwitz-riley acoustic slopes, to move the stereo soundstage well outside the plane of the loudspeakers. 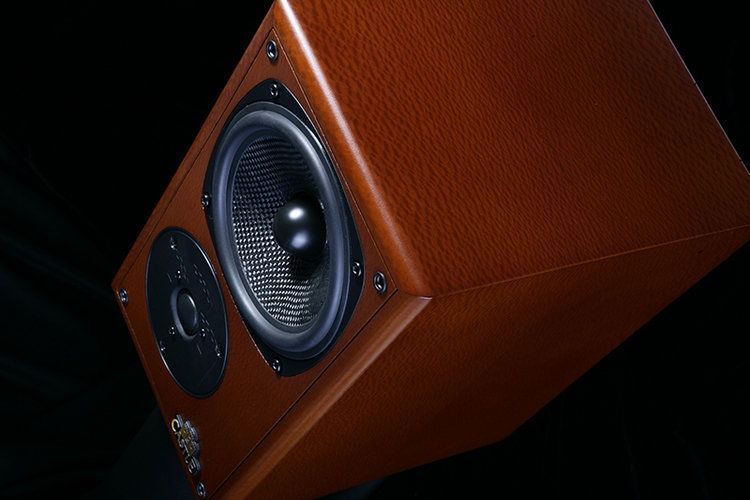 In addition the treble units are offset to scatter front baffle reflections, enhanced by the new, profiled edges of the cabinet. 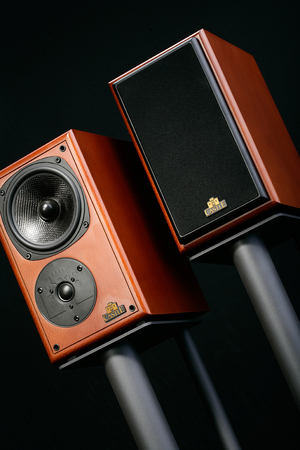 Richmond Anniversary speakers are supplied in handed pairs to give a precisely focused soundstage. Input to the crossover and drive units are now via updated bi-wire terminals which accept bare wires, spade lugs, pins or 4mm plugs allowing for your preference of cable. Each leaf of veneer is selected by eye to suit the size of the cabinet and each pair of cabinets is manufactured in mirror-matched pairs. 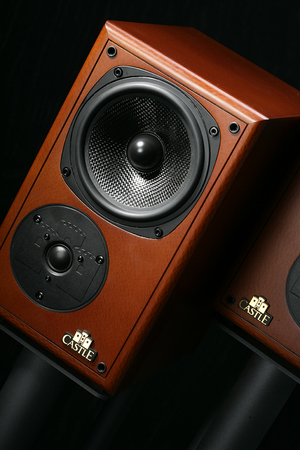 Castle selects the finest crown cut quality veneers making sure you find the Castle Richmond Anniersary a feast for both your eyes and your ears. 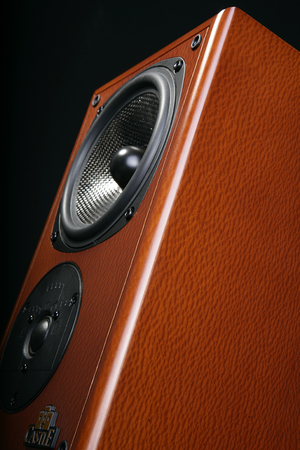 For the collector’s edition we have selected a precious Lacewood veneer. It’s attractive and figurative grain makes it a popular veneer for acoustic guitar’s, furniture and cabinet making – a perfect match for it’s musical richness. Op afspraak kan apparatuur ook in Lunteren langs gebracht worden. Wij zorgen er dan voor dat het in Dordrecht terecht komt. Door de site te gebruiken gaat u akkoord met onze privacyvoorwaarden en het gebruik van cookies.